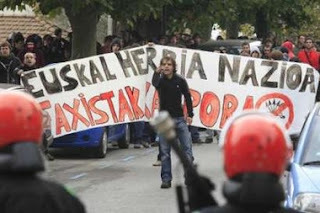 The banner reads: "Fascists out of the Basque Nation"
Guernica, Basque, Spain - Anti-fascist demonstrators clashed with police, damaged state and private property and ran riot in the streets setting rubbish bins on fire in order to show their intolerance to the presence of the extreme right wing Francoist leader Ricardo Sáenz de Ynestrillas. Sáenz rose to prominence in the early 1990s as the head of the Movimiento Social Español, an ultra nationalist movement that aims to restrict immigration and outlaw ethnic or regional minority political organizations based in Catalonia and the Basque Country. Sáenz is also a defense attorney and was in Guernica to defend three soldiers accused of assaulting a waiter at a tavern in June. At least on 19 year-old male protester was arrested and is facing vandalism charges.